Home » College News » Move it! 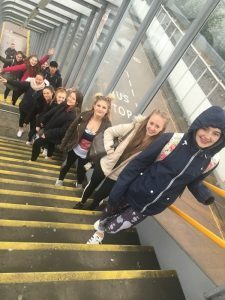 The BTEC dancers were accompanied by Kelley and Carly to indulge in a weekend of workshops, master classes and dance related entertainment at Excel London. Famous dancers such as; Neil and Katya from Strictly Come Dancing, Kimberley Wyatt and Jennifer Ellison performed and led workshops. There were stalls for dance wear, universities, theatre and performance schools, make up stands, hair stands. There were also opportunities to attend educational seminars and meet celebrities and enter competitions. An exciting and exhausting weekend was had by all!